For the practice of diving with a rebreather, see rebreather diving. A rebreather is a breathing apparatus that absorbs the carbon dioxide of a user's exhaled breath to permit the rebreathing (recycling) of the substantially unused oxygen content of each breath. Oxygen is added to replenish the amount metabolised by the user. This differs from an open-circuit breathing apparatus, where the exhaled gas is discharged directly into the environment. Rebreather technology may be used where breathing gas supply is limited, such as underwater or in space, where the environment is toxic or hypoxic, as in firefighting, mine rescue and high-altitude operations, or where the breathing gas is specially enriched or contains expensive components, such as helium diluent or anaesthetic gases. As self-contained breathing apparatus – where it is variously known as "closed circuit scuba", "closed circuit rebreather" (CCR), "semi-closed scuba", "semi-closed rebreather" (SCR), "closed circuit underwater breathing apparatus" (CCUBA – a military term), or just "rebreather", as opposed to "open circuit scuba" where the diver exhales breathing gas into the surrounding water. Surface-supplied diving equipment may incorporate rebreather technology either as a gas reclaim system, where the surface supplied breathing gas is returned and scrubbed at the surface, or as a self-contained diver bailout system. Mine rescue and other industrial applications – where poisonous gases may be present or oxygen may be absent. Crewed spacecraft and space suits – outer space is, effectively, a vacuum without oxygen to support life. Hospital anaesthesia breathing systems – to supply controlled concentrations of anaesthetic gases to patients without contaminating the air that the staff breathe. Himalayan mountaineering. High altitude reduces the partial pressure of oxygen in the ambient air, which reduces the ability of the climber to function effectively. Mountaineering rebreathers provide a higher partial pressure of oxygen to the climber. Submarines, underwater habitats, and saturation diving systems use a scrubber system working on the same principles as a rebreather. Open circuit breathing apparatus used by firefighters and underwater divers, which supplies fresh gas for each breath, which is then discharged into the environment. Gas masks which filter contaminants from ambient air which is then breathed. The recycling of breathing gas comes at the cost of mass, bulk, technological complexity and specific hazards, which depend on the specific application and type of rebreather used. As a person breathes, the body consumes oxygen and produces carbon dioxide. Base metabolism requires about 0.25 L/min of oxygen from a breathing rate of about 6 L/min, and a fit person working hard may ventilate at a rate of 95 L/min but will only metabolise about 4 L/min of oxygen  The oxygen metabolised is generally about 4% to 5% of the inspired volume at normal atmospheric pressure, or about 20% of the available oxygen in sea level air. Exhaled air at sea level still contains roughly 16% oxygen. The situation is even more wasteful of oxygen when the oxygen fraction of the breathing gas is higher, and in underwater diving, the compression of breathing gas due to depth makes the recirculation of exhaled gas even more desirable, as an even larger proportion of open circuit gas is wasted. Continued rebreathing of the same gas will deplete the oxygen to a level which will no longer support consciousness, and eventually life, so gas containing oxygen must be added to the breathing gas to maintain the required concentration of oxygen. However, if this is done without removing the carbon dioxide, it will rapidly build up in the recycled gas, resulting almost immediately in mild respiratory distress, and rapidly developing into further stages of hypercapnia, or carbon dioxide toxicity. A high ventilation rate is usually necessary to eliminate the metabolic product carbon dioxide (CO2). The breathing reflex is triggered by CO2 concentration in the blood, not by the oxygen concentration, therefore even a small buildup of CO2 in the inhaled gas quickly becomes intolerable; if a person tries to directly rebreathe their exhaled breathing gas, they will soon feel an acute sense of suffocation, therefore rebreathers must chemically remove the CO2 in a component known as a carbon dioxide scrubber. By adding sufficient oxygen to compensate for the metabolic usage, removing the carbon dioxide, and rebreathing the gas, most of the volume is conserved. Relation of physiological effects to carbon dioxide concentration and exposure period. Around 1620, in England, Cornelius Drebbel made an early oar-powered submarine. To re-oxygenate the air inside it, he likely generated oxygen by heating saltpetre (potassium nitrate) in a metal pan to emit oxygen. Heating turns the saltpetre into potassium oxide or hydroxide, which absorbs carbon dioxide from the air. That may explain why Drebbel's men were not affected by carbon dioxide build-up as much as would be expected. If so, he accidentally made a crude rebreather more than two centuries before Saint Simon Sicard's patent. The first basic rebreather based on carbon dioxide absorption was patented in France in 1808 by Sieur Touboulic from Brest, a mechanic in Napoleon's Imperial Navy. This early rebreather design worked with an oxygen reservoir, the oxygen being delivered progressively by the diver and circulating in a closed circuit through a sponge soaked in limewater. Touboulic called his invention Ichtioandre (Greek for 'fish-man'). There is no evidence of a prototype having been manufactured. A prototype rebreather was built in 1849 by Pierre Aimable De Saint Simon Sicard, and in 1853 by Professor T. Schwann in Belgium. It had a large back mounted oxygen tank with working pressure of about 13.3 bar, and two scrubbers containing sponges soaked in caustic soda. 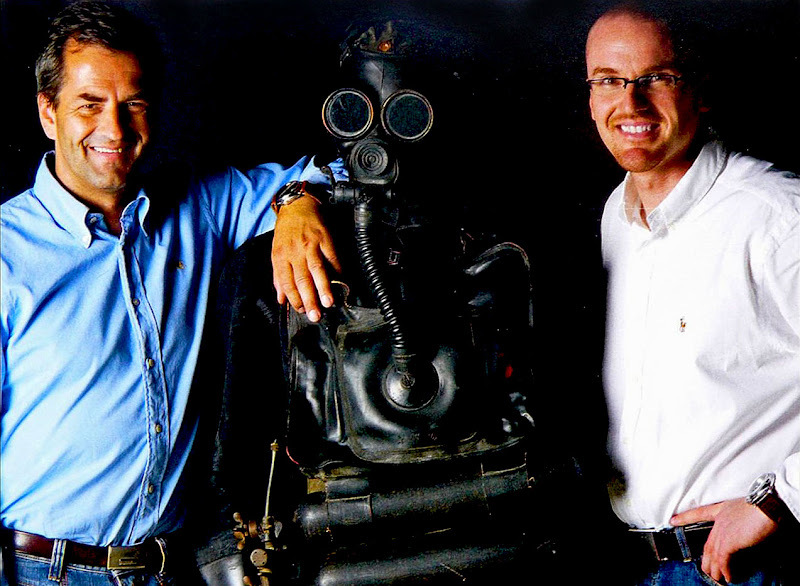 Henry Fleuss, inventor of the rebreather. The first commercially practical closed-circuit scuba was designed and built by the diving engineer Henry Fleuss in 1878, while working for Siebe Gorman in London. His self-contained breathing apparatus consisted of a rubber mask connected to a breathing bag, with (estimated) 50–60% O2 supplied from a copper tank and CO2 scrubbed by rope yarn soaked in a solution of caustic potash; the system giving a duration of about three hours. Fleuss tested his device in 1879 by spending an hour submerged in a water tank, then one week later by diving to a depth of 5.5 m in open water, upon which occasion he was slightly injured when his assistants abruptly pulled him to the surface. His apparatus was first used under operational conditions in 1880 by the lead diver on the Severn Tunnel construction project, who was able to travel 1000 feet in the darkness to close several submerged sluice doors in the tunnel; this had defeated the best efforts of hard hat divers due to the danger of their air supply hoses becoming fouled on submerged debris, and the strong water currents in the workings. Fleuss continually improved his apparatus, adding a demand regulator and tanks capable of holding greater amounts of oxygen at higher pressure. Sir Robert Davis, head of Siebe Gorman, perfected the oxygen rebreather in 1910 with his invention of the Davis Submerged Escape Apparatus, the first practical rebreather to be made in quantity. While intended primarily as an emergency escape apparatus for submarine crews, it was soon also used for diving, being a handy shallow water diving apparatus with a thirty-minute endurance, and as an industrial breathing set. The rig comprised a rubber breathing/buoyancy bag containing a canister of barium hydroxide to scrub exhaled CO2 and, in a pocket at the lower end of the bag, a steel pressure cylinder holding approximately 56 litres of oxygen at a pressure of 120 bar. The cylinder was equipped with a control valve and was connected to the breathing bag. Opening the cylinder's valve admitted oxygen to the bag and charged it to the pressure of the surrounding water. The rig also included an emergency buoyancy bag on the front of to help keep the wearer afloat. The DSEA was adopted by the Royal Navy after further development by Davis in 1927. Various industrial oxygen rebreathers such as the Siebe Gorman Salvus and the Siebe Gorman Proto, both invented in the early 1900s, were derived from it. Professor Georges Jaubert invented the chemical compound Oxylithe in 1907. It was a form of sodium peroxide (Na2O2) or sodium superoxide (NaO2). As it absorbs carbon dioxide in a rebreather's scrubber it emits oxygen. This compound was first incorporated into a rebreather design by Captain S.S. Hall and Dr. O. Rees of the Royal Navy in 1909. Although intended for use as a submarine escape apparatus, it was never accepted by the Royal Navy and was instead used for shallow water diving. In 1912 the German firm Dräger began mass production of their own version of standard diving dress with the air supply from a rebreather. The apparatus had been invented some years earlier by Hermann Stelzner for mine rescues, an engineer at the Dräger company. In the 1930s, Italian sport spearfishers began to use the Davis rebreather; Italian manufacturers received a license from the English patent holders to produce it. This practice soon came to the attention of the Italian Navy, which developed its frogman unit Decima Flottiglia MAS and was used effectively in World War II. 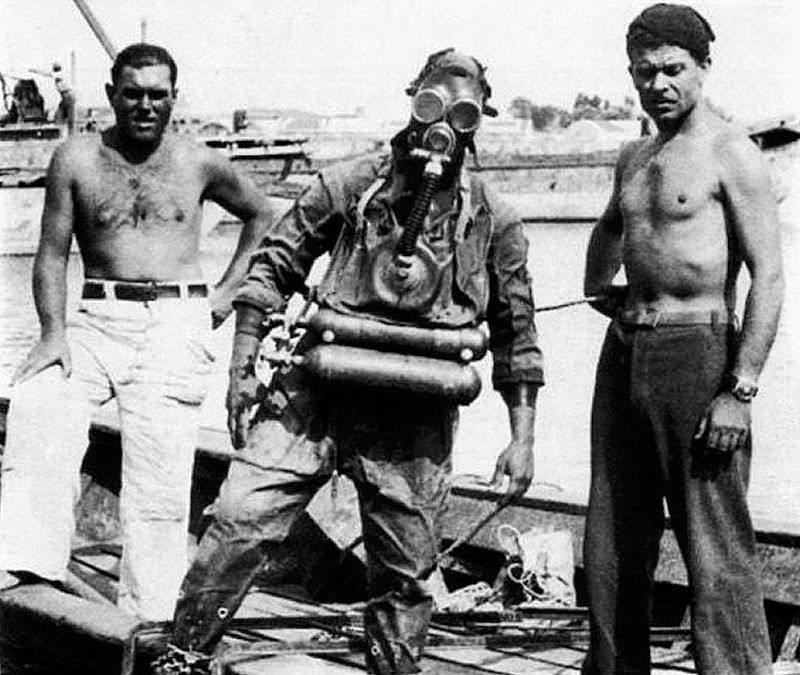 During the Second World War, captured Italian frogmen's rebreathers influenced improved designs for British rebreathers. Many British frogmen's breathing sets used aircrew breathing oxygen cylinders salvaged from shot-down German Luftwaffe aircraft. The earliest of these breathing sets may have been modified Davis Submerged Escape Apparatus; their fullface masks were the type intended for the Siebe Gorman Salvus, but in later operations different designs were used, leading to a fullface mask with one big face window, at first oval and later rectangular (mostly flat, but the sides curved back to allow better vision sideways). Early British frogman's rebreathers had rectangular counterlungs on the chest like Italian frogman's rebreathers, but later designs had a square recess in the top of the counterlung so it could extend further up toward the shoulders. In front they had a rubber collar that was clamped around the absorbent canister. Some British armed forces divers used bulky thick diving suits called Sladen suits; one version of it had a flip-up single faceplate for both eyes to let the user get binoculars to his eyes when on the surface. The Dräger rebreathers, especially the DM20 and DM40 model series, were used by the German helmet divers and German frogmen during World War II. Rebreathers for the US Navy were developed by Dr. Christian J. Lambertsen for underwater warfare. Lambertsen held the first closed-circuit oxygen rebreather course in the United States for the Office of Strategic Services maritime unit at the Naval Academy on 17 May 1943. The diving pioneer Hans Hass used Dräger oxygen rebreathers in the early 1940s for underwater cinematography. Due to the military importance of the rebreather, amply demonstrated during the naval campaigns of the Second World War, most governments were reluctant to issue the technology into the public domain. In Britain rebreather use for civilians was negligible – the BSAC even formally prohibited rebreather use by its members. The Italian firms Pirelli and Cressi-Sub at first each sold a model of sport diving rebreather, but after a while discontinued those models. Some home made rebreathers were used by cave divers to penetrate cave sumps. With the end of the Cold War and the subsequent collapse of the Communist Bloc, the perceived risk of attack by combat divers dwindled. Western armed forces had less reason to requisition civilian rebreather patents, and automatic and semi-automatic recreational diving rebreathers started to appear. This is the earliest type of rebreather and was commonly used by navies and for mining rescue from the early twentieth century. Oxygen rebreathers can be remarkably simple designs, and they were invented before open-circuit scuba. They only supply oxygen, so there is no requirement to control the gas mixture other than removing the carbon dioxide. In some rebreathers, e.g. the Siebe Gorman Salvus, the oxygen cylinder has oxygen supply mechanisms in parallel. One is constant flow; the other is a manual on-off valve called a bypass valve; both feed into the same hose which feeds the counterlung. In the Salvus there is no second stage and the gas is turned on and off at the cylinder. Others such as the USN Mk25 UBA are supplied via a demand valve on the counterlung. This will add gas at any time that the counterlung is emptied and the diver continues to inhale. Oxygen can also be added manually by a button which activates the demand valve. Some simple oxygen rebreathers had no automatic supply system, but only the manual feed valve, and the diver had to operate the valve at intervals to refill the breathing bag as the volume of oxygen decreased below a comfortable level. These are generally used for underwater diving, as they are bulkier and heavier than closed circuit oxygen rebreathers. Military and recreational divers use these because they provide better underwater duration than open circuit, have a deeper maximum operating depth than oxygen rebreathers and can be fairly simple and cheap. They do not rely on electronics for control of gas composition, but may use electronic monitoring for improved safety and more efficient decompression. Semi-closed circuit equipment generally supplies one breathing gas such as air, nitrox or trimix at a time. The gas is injected into the loop at a constant rate to replenish oxygen consumed from the loop by the diver. Excess gas must be constantly vented from the loop in small volumes to make space for fresh, oxygen-rich gas. As the oxygen in the vented gas cannot be separated from the inert gas, semi-closed circuit is wasteful of oxygen. A gas mix which has a maximum operating depth that is safe for the depth of the dive being planned, and which will provide a breathable mixture at the surface must be used, or it will be necessary to change mixtures during the dive. As the amount of oxygen required by the diver increases with work rate, the gas injection rate must be carefully chosen and controlled to prevent unconsciousness in the diver due to hypoxia. A higher gas addition rate reduces the likelihood of hypoxia but wastes more gas. Schematic diagram of the breathing gas circuit of a passive addition semi-closed circuit rebreather. This type of rebreather works on the principle of adding fresh gas to compensate for reduced volume in the breathing circuit. A portion of the respired gas is discharged that is in some way proportional to usage. Generally it is a fixed volumetric fraction of the respiratory flow, but more complex systems have been developed which exhaust a close approximation of a ratio to the surface respiratory flow rate. These are described as depth compensated or partially depth compensated systems. Gas addition is triggered by low counterlung volume. The simple case of a fixed ratio discharge can be achieved by concentric bellows counterlungs, where the exhaled gas expands both the counterlungs, and while the larger volume outer bellows discharges back to the loop when the diver inhales the next breath, the inner bellows discharges its contents to the surroundings, using non return valves to ensure a one-directional flow. The amount processed during each breath depends on the tidal volume of that breath. Towards the end of inhalation the bellows bottoms out and activates an addition valve, in much the way that a regulator diaphragm activates the demand valve, to make up the gas discharged by the inner bellows. This type of rebreather therefore tends to operate at a minimal volume. The fixed ratio systems usually discharge between 10% (1/10) and 25% (1/4) of the volume of each breath overboard. As a result, gas endurance is from 10 times to four times that of open circuit, and depends on breathing rate and depth in the same way as for open circuit. Oxygen fraction in the loop depends on the discharge ratio, and to a lesser extent on the breathing rate and work rate of the diver. As some gas is recycled after breathing, the oxygen fraction will always be lower than that of the make-up gas, but can closely approximate the make-up gas after a loop flush, so the gas is generally chosen to be breathable at maximum depth, which allows it to be used for open circuit bailout. The loop gas oxygen fraction will increase with depth, as the mass rate of oxygen used metabolically remains almost constant with a change in depth. This is the opposite tendency of what is done in a closed circuit rebreather, where the oxygen partial pressure is controlled to be more or less the same within limits throughout the dive. The fixed ratio system has been used in the DC55 and Halcyon RB80 rebreathers. Passive addition rebreathers with small discharge ratios may become hypoxic near the surface when moderate oxygen fraction supply gas is used. The depth compensating systems discharge a portion of the diver's tidal volume which varies in inverse proportion to the absolute pressure. At the surface they generally discharge between 20% (1/5) and 33% (1/3)of each breath, but that decreases with depth, to keep the oxygen fraction in the loop approximately constant and reduce gas consumption. A fully depth compensated system will discharge a volume of gas, inversely proportional to pressure, so that the volume discharged at 90m depth (10 bar absolute pressure) will be 10% of the surface discharge. This system will provide an approximately fixed oxygen fraction regardless of depth, when used with the same make-up gas, because the effective mass discharge remains constant. Partially depth compensating systems are part way between the fixed ratio and the depth compensating systems. They provide a high discharge ratio near the surface, but the discharge ratio is not fixed either as a proportion of respired volume or mass. Gas oxygen fraction is more difficult to calculate, but will be somewhere between the limiting values for fixed ratio and fully compensated systems. The Halcyon PVR-BASC uses a variable volume inner bellows system to compensate for depth. An active addition system adds feed gas to the breathing circuit and excess gas is dumped to the environment. These rebreathers tend to operate near maximum volume. The most common system of active addition of make-up gas in semi-closed rebreathers is by use of a constant mass flow injector, also known as choked flow. This is easily achieved by using a sonic orifice, as provided the pressure drop over the orifice is sufficient to ensure sonic flow, the mass flow for a specific gas will be independent of the downstream pressure. The mass flow through a sonic orifice is a function of the upstream pressure and the gas mixture, so the upstream pressure must remain constant for the working depth range of the rebreather to provide a reliably predictable mixture in the breathing circuit, and a modified regulator is used which is not affected by changes in ambient pressure. Gas addition is independent of oxygen use, and the gas fraction in the loop is strongly dependent on exertion of the diver – it is possible to dangerously deplete the oxygen by excessive physical exertion. Only one model using this gas mixture control principle has been marketed. This is the Interspiro DCSC. The principle of operation is to add a mass of oxygen that is proportional to the volume of each breath. This approach is based on the assumption that the volumetric breathing rate of a diver is directly proportional to metabolic oxygen consumption, which experimental evidence indicates is close enough to work. The fresh gas addition is made by controlling the pressure in a dosage chamber proportional to the counterlung bellows volume. The dosage chamber is filled with fresh gas to a pressure proportional to bellows volume, with the highest pressure when the bellows is in the empty position. When the bellows fills during exhalation, the gas is released from the dosage chamber into the breathing circuit, proportional to the volume in the bellows during exhalation, and is fully released when the bellows is full. Excess gas is dumped to the environment through the overpressure valve after the bellows is full. The result is the addition of a mass of gas proportional to ventilation volume, and the oxygen fraction is stable over the normal range of exertion. The volume of the dosage chamber is matched to a specific supply gas mixture, and is changed when the gas is changed. The DCSC uses two standard mixtures of nitrox: 28% and 46%. Schematic diagram of electronically controlled closed circuit mixed gas rebreather. Military, photographic, and recreational divers use closed circuit rebreathers because they allow long dives and produce no bubbles. Closed circuit rebreathers supply two breathing gases to the loop: one is pure oxygen and the other is a diluent or diluting gas such as air, nitrox, heliox or trimix. A major function of the closed circuit rebreather is to control the oxygen partial pressure in the loop and to warn the diver if it becomes dangerously low or high. Too low a concentration of oxygen results in hypoxia leading to unconsciousness and ultimately death. Too high a concentration of oxygen results in hyperoxia, leading to oxygen toxicity, a condition causing convulsions which can make the diver lose the mouthpiece when they occur underwater, and can lead to drowning. The monitoring system uses oxygen sensitive electro-galvanic fuel cells to measure the partial pressure of oxygen in the loop. The partial pressure of oxygen in the loop can generally be controlled within reasonable tolerance of a fixed value. This set point is chosen to provide an acceptable risk of both long-term and acute oxygen toxicity, while minimizing the decompression requirements for the planned dive profile. The gas mixture is controlled by the diver in manually controlled closed circuit rebreathers. The diver can manually control the mixture by adding diluent gas or oxygen. Adding diluent can prevent the loop gas mixture becoming too oxygen rich, and adding oxygen is done to increase oxygen concentration. In fully automatic closed-circuit systems, an electronically controlled solenoid valve injects oxygen into the loop when the control system detects that the partial pressure of oxygen in the loop has fallen below the required level. Electronically controlled CCRs can be switched to manual control in the event of some control system failures. Addition of gas to compensate for compression during descent is usually done by an automatic diluent valve. There have been a few rebreather designs (e.g. the Oxylite) which had an absorbent canister filled with potassium superoxide, which gives off oxygen as it absorbs carbon dioxide: 4KO2 + 2CO2 = 2K2CO3 + 3O2; it had a very small oxygen cylinder to fill the loop at the start of the dive. This system is dangerous because of the explosively hot reaction that happens if water gets on the potassium superoxide. The Russian IDA71 military and naval rebreather was designed to be run in this mode or as an ordinary rebreather. Tests on the IDA71 at the United States Navy Experimental Diving Unit in Panama City, Florida showed that the IDA71 could give significantly longer dive time with superoxide in one of the canisters than without. A cryogenic rebreather removes the carbon dioxide by freezing it out in a "snow box" by the low temperature produced as liquid oxygen evaporates to replace the oxygen used. A cryogenic rebreather called the S-1000 was built around or soon after 1960 by Sub-Marine Systems Corporation. It had a duration of 6 hours and a maximum dive depth of 200 metres (660 ft). Its ppO2 could be set to anything from 0.2 to 2 bars (3 to 30 psi) without electronics, by controlling the temperature of the liquid oxygen, thus controlling the equilibrium pressure of oxygen gas above the liquid. The diluent could be either liquid nitrogen or helium depending on the depth of the dive. The set could freeze out 230 grams of carbon dioxide per hour from the loop, corresponding to an oxygen consumption of 2 litres per minute. If oxygen was consumed faster (high workload), a regular scrubber was needed. Cryogenic rebreathers were widely used in Soviet oceanography in the period 1980 to 1990. The widest variety of rebreather types is used in diving, as the consequences of breathing under pressure complicate the requirements, and a large range of options are available depending on the specific application and available budget. As pure oxygen is toxic when inhaled at pressure, recreational diver certification agencies limit oxygen decompression to a maximum depth of 6 metres (20 ft) and this restriction has been extended to oxygen rebreathers; In the past they have been used deeper (up to 20 metres (66 ft)) but such dives were more risky than what is now considered acceptable. Oxygen rebreathers are also sometimes used when decompressing from a deep open-circuit dive, as breathing pure oxygen helps the nitrogen diffuse out of the body tissues more rapidly, and the use of a rebreather may be more convenient for long decompression stops. Normal working limit 25 feet (7.6 m) for 240 minutes. Maximum working limit 50 feet (15 m) for 10 minutes. Oxygen rebreathers are no longer commonly used in recreational diving because of the depth limit imposed by oxygen toxicity, but are extensively used for military attack swimmer applications where greater depth is not required, due to their simplicity, light weight and compact size. Semi-closed circuit rebreathers used for diving may use active or passive gas addition, and the gas addition systems may be depth compensated. They use a mixed supply gas with a higher oxygen fraction than the steady state loop gas mixture. Usually only one gas mixture is used, but it is possible to switch gas mixtures during a dive to extend the available depth range of some SCRs. Non-depth compensated passive addition SCRs reduce the safe range of operating depths in inverse proportion to gas endurance extension. This can be compensated by gas switching, at the expense of complexity and increased number of potential failure points. Constant mass flow SCRs provide a gas mixture which is not consistent over variation in diver exertion. This also limits safe operating depth range unless gas composition is monitored, also at the expense of increased complexity and additional potential failure points. Demand controlled active gas addition provides reliable gas mixtures throughout the potential operating depth range, and do not require oxygen monitoring, but at the cost of more mechanical complexity. Depth compensated passive addition provides reliable gas mixture over the potential operating depth range, which is only slightly reduced from the open circuit operational range for the gas in use at the cost of more mechanical complexity. Closed circuit diving rebreathers may be manually or electronically controlled, and use both pure oxygen and a breathable mixed gas diluent. A helium reclaim system (or push-pull system) is used to recover helium based breathing gas after use by the diver when this is more economical than losing it to the environment in open circuit systems. The recovered gas is passed through a scrubber system to remove carbon dioxide, filtered to remove odours, and pressurised into storage containers, where it may be mixed with oxygen to the required composition for re-use. There is no variation in ambient pressure on the components. The counterlung may be placed for comfort and convenience. Cooling of the gas in the breathing loop may be desirable, as the absorbent produces heat as it reacts with carbon dioxide, and the warming of the gas is not welcome in hot industrial situations such as deep mines. Absorbent containers may in some cases rely on gravity for preventing channeling. If a full-face mask is used, it may have viewports designed for convenience or improved field of vision, and they do not need to be flat and parallel to prevent visual distortion underwater. In firefighting rebreathers, consideration must be given to making the set reasonably flame-proof and protecting it from heat and debris impacts. The need to ditch the set quickly, may not arise, and harness straps may not need a quick-release. Buoyancy is not a consideration, but weight may be critical. There are no constraints due to the physiological effects of breathing under pressure. Complex gas mixtures are unnecessary. Oxygen rebreathers can usually be used. Mountaineering rebreathers provide oxygen at a higher concentration than available from atmospheric air in a naturally hypoxic environment. They need to be lightweight and to be reliable in severe cold including not getting choked with deposited frost. Both chemical and compressed gas oxygen have been used in experimental closed-circuit oxygen systems – the first on Mt. Everest in 1938. A high rate of system failures due to extreme cold has not been solved. Breathing pure oxygen results in an elevated partial pressure of oxygen in the blood: a climber breathing pure oxygen at the summit of Mt. Everest has a greater oxygen partial pressure than breathing air at sea level. This results in being able to exert greater physical effort at altitude. An atmospheric diving suit is a small one-man articulated submersible of roughly anthropomorphic form, with limb joints which allow articulation under external pressure while maintaining an internal pressure of one atmosphere. Breathing gas supply may be surface supplied by umbilical, or from a rebreather carried on the suit. An emergency gas supply rebreather may also be fitted to a suit with either surface supply or rebreather for primary breathing gas. Similar requirement and working environment to mountaineering, but weight is less of a problem. The Soviet IDA-71 rebreather was also manufactured in a high altitude version, which was operated as an oxygen rebreather. Anaesthetic machines can be configured as rebreathers to provide oxygen and anaesthetic gases to a patient during surgery or other procedures that require sedation. An absorbent is present in the machine to remove the carbon dioxide from the loop. Both semi-closed and fully closed circuit systems may be used for anaesthetic machines, and both push-pull (pendulum) two directional flow and one directional loop systems are used. The breathing circuit of a loop configured machine has two unidirectional valves so that only scrubbed gas flows to the patient while expired gas goes back to the machine. The anaesthetic machine can also provide gas to ventilated patients that are not able to breathe on their own. A waste gas scavenging system removes any gasses from the operating room to avoid environmental contamination. Anaesthesia personnel train for equipment failures using medical simulation techniques. One of the functions of a space suit is to provide the wearer with breathing gas. This can be done via an umbilical from the life-support systems of the spacecraft or habitat, or from a primary life support system carried on the suit. Both of these systems involve rebreather technology as they both remove carbon dioxide from the breathing gas and add oxygen to compensate for oxygen used by the wearer. Space suits usually use oxygen rebreathers[clarification needed] as this allows a lower pressure in the suit which gives the wearer better freedom of movement. This link describes an experimental drysuit (with built-in hood and fullface mask) and rebreather combination where the drysuit acts as the breathing bag, like in an old Draeger standard diving suit variant which had a rebreather pack attached. Although there are several design variations of diving rebreather, all types have a gas-tight loop that the diver inhales from and exhales into. The loop consists of several components sealed together. The diver breathes through a mouthpiece or a fullface mask. This is connected to one or more tubes ducting inhaled and exhaled gas between the diver and a counterlung or breathing bag. This holds gas when it is not in the diver's lungs. The loop also includes a scrubber containing carbon dioxide absorbent to remove the carbon dioxide exhaled by the diver. Attached to the loop there will be at least one valve allowing addition of gases, such as oxygen and perhaps a diluting gas, from a gas storage into the loop. There may be valves allowing venting of gas from the loop. There are two basic gas passage configurations: The loop and the pendulum. The loop configuration uses a one directional circulation of the breathing gas which on exhalation leaves the mouthpiece, passes through a non-return valve into the exhalation hose, and then through the counterlung and scrubber, to return to the mouthpiece through the inhalation hose and another non-return valve when the diver inhales. The pendulum configuration uses a two-directional flow. Exhaled gas flows from the mouthpiece through a single hose to the scrubber, into the counterlung, and on inhalation the gas is drawn back through the scrubber and the same hose back to the mouthpiece. The pendulum system is structurally simpler, but inherently contains a larger dead space of unscrubbed gas in the combined exhalation and inhalation tube, which is rebreathed. There are conflicting requirements for minimising the volume of dead space while minimising the flow resistance of the breathing passages. The diver breathes from the rebreather circuit through a bite-grip mouthpiece or an oro-nasal mask which may be part of a full-face mask or diving helmet. The mouthpiece is connected to the rest of the rebreather by breathing hoses. The mouthpiece of a diving rebreather will usually include a shutoff valve, and may incorporate a dive/surface valve or a bailout valve or both. On loop configured rebreathers the mouthpiece is usually the place where the non-return valves for the loop are fitted. The Dive/Surface valve (DSV) is a valve on the mouthpiece which can switch between the loop and ambient surroundings. It is used to close the loop at the surface to allow the diver to breathe atmospheric air, and may also be used underwater to isolate the loop so that it will not flood if the mouthpiece is taken out of the mouth. A dive/surface valve which can be switched to close the loop and simultaneously open a connection to an open circuit demand valve is known as a bailout valve, as its function is to switch over to open circuit bailout without having to remove the mouthpiece. An important safety device when carbon dioxide poisoning occurs. Flexible corrugated synthetic rubber hoses are used to connect the mouthpiece to the rest of the breathing circuit, as these allow free movement of the diver's head. These hoses are corrugated to allow greater flexibility while retaining a high resistance to collapse. The hoses are designed to provide low resistance to flow of the breathing gas. A single breathing hose is used for pendulum (push-pull) configuration, and two hoses for a one-way loop configuration. The counterlung is a part of the loop which is designed to change in volume by the same amount as the user's tidal volume when breathing. This lets the loop expand and contract when the user breathes, letting the total volume of gas in the lungs and the loop remain constant throughout the breathing cycle. The volume of the counterlung should allow for the maximum likely breath volume of a user, but does not generally need to match the vital capacity of all possible users. Underwater, the position of the counterlung – on the chest, over the shoulders, or on the back – has an effect on the hydrostatic work of breathing. This is due to the pressure difference between the counterlung and the diver's lung caused by the vertical distance between the two. Recreational, technical and many professional divers will spend most of their time underwater swimming face down and trimmed horizontally. Counterlungs should function well with low work of breathing in this position, and with the diver upright. Front mounted: When horizontal they are under greater hydrostatic pressure than the diver’s lungs. Easier to inhale, harder to exhale. Back mounted: When horizontal they are under less hydrostatic pressure than the diver’s lungs. The amount varies, as some are closer to the back than others. Harder to inhale, easier to exhale. Over the shoulder: The hydrostatic pressure will vary depending on how much gas is in the counterlungs, and increases as the volume increases and the lowest part of the gas space moves downward. The resistive work of breathing often negates the gains of good positioning close to the lung centroid. The design of the counterlungs can also affect the swimming diver's streamlining due to location and shape of the counterlungs themselves. For use out of water, counterlung position does not affect work of breathing and it can be positioned wherever convenient. For example, in an industrial version of the Siebe Gorman Salvus the breathing bag hangs down by the left hip. A rebreather which uses rubber counterlungs which are not in an enclosed casing should be sheltered from sunlight when not in use, to prevent the rubber from perishing due to ultraviolet light. Most passive addition semi-closed diving rebreathers control the gas mixture by removing a fixed volumetric proportion of the exhaled gas, and replacing it with fresh feed gas from a demand valve, which is triggered by low volume of the counterlung. This is done by using concentric bellows counterlungs – the counterlung is configured as a bellows with a rigid top and bottom, and has a flexible corrugated membrane forming the side walls. There is a second, smaller bellows inside, also connected to the rigid top and bottom surfaces of the counterlung, so that as the rigid surfaces move towards and away from each other, the volumes of the inner and outer bellows change in the same proportion. The exhaled gas expands the counterlungs, and some of it flows into the inner bellows. On inhalation, the diver only breathes from the outer counterlung – return flow from the inner bellows is blocked by a non-return valve. The inner bellows also connects to another non-return valve opening to the outside environment, and thus the gas from the inner bellows is dumped from the circuit in a fixed proportion of the volume of the inhaled breath. If the counterlung volume is reduced sufficiently for the rigid cover to activate the feed gas demand valve, gas will be added until the diver finishes that inhalation. The exhaled gases are directed through the chemical scrubber, a canister full of some suitable carbon dioxide absorbent such as a form of soda lime, which removes the carbon dioxide from the gas mixture and leaves the oxygen and other gases available for re-breathing. Some absorbent chemical designed for diving applications are Sofnolime, Dragersorb, or Sodasorb. Some systems use a prepackaged Reactive Plastic Curtain (RPC) based cartridge: Reactive Plastic Curtain (RPC) was first used between Micropore Inc. and the US Navy to describe Micropore's absorbent curtains for emergency submarine use, and then more recently RPC has been used on the web to describe their Reactive Plastic Cartridges – ExtendAir. The carbon dioxide passing through the scrubber absorbent is removed when it reacts with the absorbent in the canister; this chemical reaction is exothermic. This reaction occurs along a "front" which is a cross section of the canister, of the unreacted soda lime that is exposed to carbon dioxide-laden gas. This front moves through the scrubber canister, from the gas input end to the gas output end, as the reaction consumes the active ingredients. However, this front would be a wide zone, because the carbon dioxide in the gas going through the canister needs time to reach the surface of a grain of absorbent, and then time to penetrate to the middle of each grain of absorbent as the outside of the grain becomes exhausted. In larger systems, such as recompression chambers, a fan is used to pass gas through the canister. In rebreather diving, the typical effective duration of the scrubber will be half an hour to several hours of breathing, depending on the granularity and composition of the soda lime, the ambient temperature, the design of the rebreather, and the size of the canister. In some dry open environments, such as a recompression chamber or a hospital, it may be possible to put fresh absorbent in the canister when break through occurs. During ascent the gas in the breathing circuit will expand, and must have some way of escape before the pressure difference causes injury to the diver or damage to the loop. The simplest way to do this is for the diver to allow excess gas to escape around the mouthpiece or through the nose, but a simple overpressure valve is reliable and can be adjusted to control the permitted overpressure. The overpressure valve is typically mounted on the counterlung and in military diving rebreathers it may be fitted with a diffuser. Some military diving rebreathers have a diffuser over the blowoff valve, which helps to conceal the diver's presence by masking the release of bubbles, by breaking them up to sizes which are less easily detected. A diffuser also reduces bubble noise. Many rebreathers have "water traps" in the counterlungs or scrubber casing, to stop large volumes of water from entering the scrubber media if the diver removes the mouthpiece underwater without closing the valve, or if the diver's lips get slack and let water leak in. Some rebreathers have manual pumps to remove water from the water traps, and a few of the passive addition SCRs automatically pump water out along with the gas during the exhaust stroke of the bellows counterlung. Work of breathing of a rebreather has two main components: Resistive work of breathing is due to the flow restriction of the gas passages causing resistance to flow of the breathing gas, and exists in all applications where there is no externally powered ventilation. Hydrostatic work of breathing is only applicable to diving applications, and is due to difference in pressure between the lungs of the diver and the counterlungs of the rebreather. This pressure difference is generally due to a difference in hydrostatic pressure caused by a difference in depth between lung and counterlung, but can be modified by ballasting the moving side of a bellows counterlung. Resistive work of breathing is the sum of all the restrictions to flow due to bends, corrugations, changes of flow direction, valve cracking pressures, flow through scrubber media, etc., and the resistance to flow of the gas, due to inertia and viscosity, which are influenced by density, which is a function of molecular weight and pressure. Rebreather design can limit the mechanical aspects of flow resistance, particularly by the design of the scrubber, counterlungs and breathing hoses. Diving rebreathers are influenced by the variations of work of breathing due to gas mixture choice and depth. Helium content reduces work of breathing, and increased depth increases work of breathing. A rebreather must have a source of oxygen to replenish that consumed by the diver. Depending on the rebreather design variant, the oxygen source will either be pure or a breathing gas mixture which is almost always stored in a gas cylinder. In a few cases oxygen is supplied as liquid oxygen or from a chemical reaction. Pure oxygen is not considered to be safe for recreational diving deeper than 6 meters, so recreational rebreathers and many professional diving rebreathers also have a cylinder of diluent gas. This diluent cylinder may be filled with compressed air or another diving gas mix such as nitrox or trimix. The diluent reduces the percentage of oxygen breathed and increases the maximum operating depth of the rebreather. The diluent is not an oxygen-free gas, such as pure nitrogen or helium, and is breathable as it will be used in an emergency either to flush the loop with breathable gas of a known composition or as a bailout. Closed circuit rebreathers usually allow the diver to add gas manually. In oxygen rebreathers this is just oxygen, but mixed gas rebreathers usually have a sperate manual addition valve for oxygen and diluent, as either might be required to correct the composition of the loop mixture, either as the standard operating method for manually controlled CCRs, or as a backup system on electronically controlled CCRs. The manual diluent addition is sometimes by a purge button on the ADV. Constant mass flow gas addition is used on active addition semi-closed rebreathers, where it is the normal method of addition at constant depth, and in many closed circuit rebreathers, where it is the primary method of oxygen addition, at a rate less than metabolically required by the diver at rest, and the rest is made up by the control system through a solenoid valve, or manually by the diver. Constant mass flow is achieved by sonic flow through an orifice. The flow of a compressible fluid through an orifice is limited to the flow at sonic velocity in the orifice. This can be controlled by the upstream pressure and the orifice size and shape, but once the flow reached the speed of sound in the orifice, any further reduction of downstream pressure has no influence on the flow rate. This requires a gas source at a fixed pressure, and it only works at depths which have a low enough ambient pressure to provide sonic flow in the orifice. Regulators which have their control components isolated from the ambient pressure are used to supply gas at a pressure independent of the depth. In passive addition semi-closed rebreathers, gas is usually added by a demand type valve actuated by the bellows counterlung when the bellows is empty. This is the same actuation condition as the automatic diluent valve of any rebreather, but the actual trigger mechanism is slightly different. A passive rebreather of this type does not need a separate ADV as the passive addition valve already serves this function. Electronically controlled closed circuit mixed gas rebreathers may have part of the oxygen feed provided by a constant mass flow orifice, but the fine control of partial pressure is done by solenoid operated valves actuated by the control circuits. Timed opening of the solenoid valve will be triggered when the oxygen partial pressure in the loop mix drops below the lower set-point. If the constant mass flow orifice is compromised and does not deliver the correct flow, the control circuit will compensate by firing the solenoid valve more often. Narked at 90 Ltd – Deep Pursuit Advanced electronic rebreather controller. The fundamental requirements for the control of the gas mixture in the breathing circuit for any rebreather application are that the carbon dioxide is removed, and kept at a tolerable level, and that the partial pressure of oxygen is kept within safe limits. For rebreathers which are used at normobaric or hypobaric pressures, this only requires that there is sufficient oxygen, which is easily achieved in an oxygen rebreather. Hyperbaric applications, as in diving, also require that the maximum partial pressure of oxygen is limited, to avoid oxygen toxicity, which is technically a more complex process, and may require dilution of the oxygen with metabolically inert gas. If not enough oxygen is added, the concentration of oxygen in the loop may be too low to support life. In humans, the urge to breathe is normally caused by a build-up of carbon dioxide in the blood, rather than lack of oxygen. Hypoxia can cause blackout with little or no warning, followed by death. The method used for controlling the range of oxygen partial pressure in the breathing loop depends on the type of rebreather. In an oxygen rebreather, once the loop has been thoroughly flushed, the mixture is effectively static at 100% oxygen, and the partial pressure is a function only of ambient pressure. the type of gas addition system and its setting, combined with the gas mixture in use, which control the rate of oxygen added. work rate, and therefore the oxygen consumption rate, which controls the rate of oxygen depletion, and therefore the resulting oxygen fraction. ambient pressure, as partial pressure in proportion to ambient pressure and oxygen fraction. In manually controlled closed circuit rebreathers the user controls the gas mixture and volume in the loop by injecting each of the different available gases to the loop and by venting the loop. Most electronically controlled closed-circuit diving rebreathers have electro-galvanic fuel cell sensors and electronic control circuits, which monitor the ppO2, injecting more oxygen if necessary and issuing an audible, visual and/or vibratory warning to the diver if the ppO2 reaches dangerously high or low levels. The volume in the loop is usually controlled by a pressure controlled automatic diluent valve, which works on the same principle as a demand valve. This adds diluent when the pressure in the loop is reduced below ambient pressure, such as during descent or if gas is lost from the loop. The set may also have a manual addition valve, sometimes called a bypass. In some early oxygen rebreathers the user had to manually open and close the valve to the oxygen cylinder to refill the counterlung each time the volume got low. In this early Russian Epron-1 rebreather, the canister and the breathing bag and the oxygen cylinder are each vertical on the chest, in order left to right; the breathing tube loop goes from the end of the canister to the bag. In this old German industrial rebreather, the working parts are on the user's left waist and it has one long breathing tube. Some are back mounted. Some are worn on the chest. Some have a hard casing. If used underwater, the counterlung must be near the user's lungs. The use duration on a fill varies widely with make. Many rebreathers have their main components in a hard backpack casing for support, protection and/or streamlining. This casing must be vented to let surrounding water or air in and out to allow for volume changes as the breathing bag inflates and deflates. A diving rebreather needs fairly large holes, including a hole at the bottom to drain the water out when the diver comes out of water. The SEFA, which is used for mine rescue, to keep grit and stones out of its working, is completely sealed, except for a large vent panel covered with metal mesh, and holes for the oxygen cylinder's on/off valve and the cylinder pressure gauge. Underwater the casing also serves for streamlining, e.g. in the IDA71 and Cis-Lunar. Hypoxia can occur in any rebreather which contains enough inert gas to allow breathing without triggering automatic gas addition. In an oxygen rebreather this can occur if the loop is not sufficiently purged at the start of use. Purging should be done while breathing off the unit so that the inert gas in the user's lungs is also removed from the system. Carbon dioxide buildup will occur if the scrubber medium is absent, badly packed, inadequate or exhausted. The normal human body is fairly sensitive to carbon dioxide partial pressure, and a buildup will be noticed by the user. However, there is not often much that can be done to rectify the problem except changing to another breathing gas supply until the scrubber can be repacked. Continued use of a rebreather with an ineffective scrubber is not possible for very long, as the levels will become toxic and the user will experience extreme respiratory distress, followed by loss of consciousness and death. The rate at which these problems develop depends on the volume of the circuit and the metabolic rate of the user. High partial pressures of oxygen greatly increase fire hazard, and many materials which are self-extinguishing in atmospheric air will burn continuously in a high oxygen concentration. Failure modes specific to diving rebreathers are covered in Rebreather diving. Complete consumption of the active ingredient ("break through"). The scrubber canister has been incorrectly packed or configured. This allows the exhaled gas to bypass the absorbent. In a rebreather, the soda lime must be packed tightly so that all exhaled gas comes into close contact with the granules of soda lime and the loop is designed to avoid any spaces or gaps between the soda lime and the loop walls that would let gas avoid contact with the absorbent. If any of the seals, such as O-rings, or spacers that prevent bypassing of the scrubber, are not cleaned or lubricated or fitted properly, the scrubber will be less efficient, or outside water or gas may get in circuit. When the gas mix is under pressure caused by depth, the inside of the canister is more crowded by other gas molecules (oxygen or diluent) and the carbon dioxide molecules are not so free to move around to reach the absorbent. In deep diving with a nitrox or other gas-mixture rebreather, the scrubber needs to be bigger than is needed for a shallow-water or industrial oxygen rebreather, because of this effect. Among British naval rebreather divers, this type of carbon dioxide poisoning was called shallow water blackout. A Caustic Cocktail – Soda lime is caustic and can cause burns to the eyes and skin. A "caustic cocktail" is a mixture of water and soda lime that occurs when the "scrubber" floods. It gives rise to a chalky taste, which should prompt the diver to switch to an alternative source of breathing gas and rinse his or her mouth out with water. Many modern diving rebreather absorbents are designed not to produce "cocktail" if they get wet. in below-freezing operation (primarily mountain climbing) the wet scrubber chemicals can freeze when oxygen bottles are changed, thus preventing CO2 from reaching the scrubber material. A transparent canister would likely be brittle and easily cracked by knocks. Opening the canister to look inside would flood it with water or let unbreathable external gas in. The canister is usually out of sight of the user, e.g. inside the breathing bag or inside a backpack box. Diver training. Divers are trained to monitor and plan the exposure time of the soda lime in the scrubber and replace it within the recommended time limit. At present, there is no effective technology for detecting the end of the life of the scrubber or a dangerous increase in the concentration of carbon dioxide causing carbon dioxide poisoning. The diver must monitor the exposure of the scrubber and replace it when necessary. Carbon dioxide gas sensors exist, such systems are not useful as a tool for monitoring scrubber life when underwater as the onset of scrubber "break through" occurs quite rapidly. Such systems should be used as an essential safety device to warn divers to bail off the loop immediately. Bailout valves – a device in the mouthpiece on the loop which connects to a bailout demand valve and can be switched to provide gas from either the loop or the demand valve without the diver taking the mouthpiece from his or her mouth. An important safety device when carbon dioxide poisoning occurs. Integrated decompression computers – these allow divers to take advantage of the content and generate a schedule of decompression stops. Carbon dioxide scrubber life monitoring systems – temperature sensors monitor the progress of the reaction of the soda lime and provide an indication of when the scrubber will be exhausted. Carbon dioxide monitoring systems – Gas sensing cell and interpretive electronics which detect the presence of carbon dioxide in the unique environment of a rebreather loop. Mannequin wearing Finnish Navy combat diver equipment. The chest rebreather is likely Viper S-10. The Davis Submerged Escape Apparatus was the first or nearly the first rebreather to be made in quantity. ,  Images of Italian wartime frogmen's rebreathers with 2 long thin crosswise oxygen cylinders and fullface mask like a gasmask. 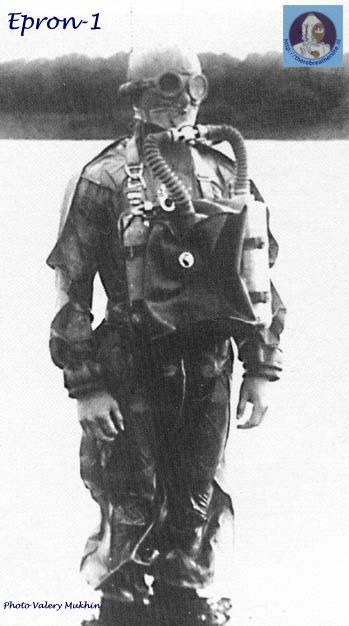 The "Universal" rebreather was a long-dive derivative of the Davis Submerged Escape Apparatus, intended to be used with the Sladen Suit, which see for more information about it. Image of c. 1940s US wartime frogman: oxygen cylinder lengthways on chest, fullface mask with one rectangular window, bag on back, loop of breathing tubes. CDBA: Clearance Diver's Breathing Apparatus. In the British Navy the Carleton CDBA is (as at June 2007) planned to be superseded by the CDLSE = "Clearance Divers' Life Support Equipment" made by Divex in Aberdeen in Scotland. It is an electronic closed circuit rebreather allowing diving to 60 metres (200 ft). The Savox was made by Siebe Gorman. See this link and the image at this link. It was an oxygen rebreather with a use duration of 45 minutes. It was worn in front of the body. It had no hard casing. The Blackett's Aerophor is a nitrox semi-closed-circuit rebreather with liquid gas storage made in England from 1910 onwards for use in mine rescue and other industrial uses. SEFA (Selected Elevated Flow Apparatus) is an industrial oxygen rebreather formerly made by Sabre Safety with 2 hours duration on a filling. SDBA is a type of frogman's oxygen rebreather. It has a nitrox variant called ONBA. FROGS (Full Range Oxygen Gas System) manufactured by Aqualung is the frogman's oxygen rebreather which has been used in France since 15 October 2002: image at this link[dead link]: see this link[dead link] for more information. The current US Navy Mark 16 Mod 2 (Explosive Ordnance Disposal) and Mark 16 Mod 3 (Naval Special Warfare) units utilize the Juergensen Defense Corporation Mark V Control System. CDLSE Clearance Divers' Life Support Equipment. FROGS Full Range Oxygen Gas System. ↑ Fig 2.4, NOAA Diving Manual, 2nd Ed. 1979, Ed. James W. Miller, Publ. US Dept of Commerce. ↑ Old French for "sir" or "Mister"
↑ Avec ou sans bulles? (With or without bubbles), an article (in French) by Eric Bahuet, published in the specialized website plongeesout.com. ↑ Henry Albert Fleuss. scubahalloffame.com. ↑ Drägerwerk page in Divingheritage.com, a specialised website. ↑ Fischel H., Closed circuit cryogenic SCUBA, "Equipment for the working diver" 1970 symposium, Washington, DC, USA. Marine Technology Society 1970:229–244. ↑ Cushman, L., Cryogenic Rebreather, Skin Diver magazine, June 1969, and reprinted in Aqua Corps magazine, N7, 28, 79. ↑ Lua error in Module:Citation/CS1/Identifiers at line 47: attempt to index field 'wikibase' (a nil value). Retrieved 2013-04-25. Rebreather Scuba Diving Rebreather world contains further information on rebreathers. The site includes a Rebreather library and Rebreather Forums, and Rebreather Trips, Vacations, and Holidays. Wikimedia Commons has media related to Rebreathers. This page was last modified on 12 January 2016, at 00:59.